Home Uncategorized How are pencils made ? How are pencils made ? One of the oldest and most widely used writing utensils, the pencil originated in prehistoric times when chalky rocks and charred sticks were used to draw on surfaces as varied as animal hides and cave walls. The Greeks and Romans used flat pieces of lead to draw faint lines on papyrus, but it was not until the late 1400s that the earliest direct ancestor of today’s pencil was developed. About one hundred years later graphite, a common mineral occurring as soft, lustrous veins in rocks, was discovered near Borrowdale in northwestern England. The Borrowdale mine supplied Europe with graphite for several hundred years; however, because people could not then differentiate between graphite and lead, they referred to the former as “black lead.” Cut into rods or strips, graphite was heavily wrapped in twine to provide strength and a comfortable handle. The finished product, called a lead pencil, was quite popular. In the late sixteenth century, a method for gluing strips of wood around graphite was discovered in Germany, and the modem pencil began to take form. In 1779, scientists determined that the material they had previously thought was lead was actually a form of microcrystalline carbon that they named graphite (from the Greek “graphein” meaning “to write”). Graphite is one of the three natural forms of pure carbon—the others are coal and diamond. In the late eighteenth century the Borrowdale mine was depleted, and, as graphite was now less plentiful, other materials had to be mixed with it to create pencils. A Frenchman chemist, Nicolas Jacques Conté, discovered that when powdered graphite, powdered clay, and water were mixed, molded, and baked, the finished product wrote as smoothly as pure graphite. Conté also discovered that a harder or softer writing core could be produced by varying the proportion of clay and graphite—the more graphite, the blacker and softer the pencil. In 1839, Lothar von Faber of Germany developed a method of making graphite paste into rods of the same thickness. He later invented a machine to cut and groove the pencil wood. Following the depletion of the once-abundant graphite source at Borrowdale, other graphite mines were gradually established around the world. A number of these mines were set up in the United States, and the first American pencils were manufactured in 1812, after the War of 1812 ended English imports. William Monroe, a cabinet maker in Concord, Massachusetts, invented a machine that cut and grooved wood slats precisely enough to make pencils. Around that time, American ‘inventor Joseph Dixon developed a method of cutting single cedar cylinders in half, placing the graphite core in one of the halves, and then gluing the two halves back together. In 1861, Eberhard Faber built the United States’ first pencil-making factory in New York City. The most important ingredient in a pencil is the graphite, which most people continue to call lead. Conte’s method of combining graphite with clay is still used, and wax or other chemicals are sometimes added as well. Virtually all graphite used today is a manufactured mixture of natural graphite and chemicals. 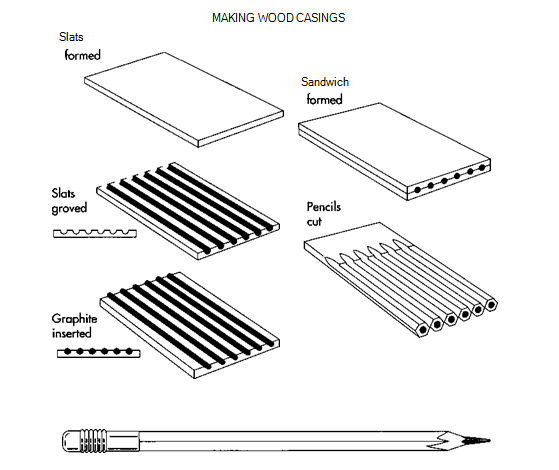 The wood used to manufacture pencils must be able to withstand repeated sharpening and cut easily without splintering. Most pencils are made from cedar (specifically, California cedar), the choice wood for many years. Cedar has a pleasant odor, does not warp or lose its shape, and is readily available. Some pencils have erasers, which are held on with a ferrule, a metal case that is either glued or held on with metal prongs. The erasers themselves consist of pumice and rubber. Now that most commercially used graphite is made in factories rather than mined, manu¬facturers are able to easily control its density. The graphite is mixed with clay according to the type of pencil being made—the more graphite used, the softer the pencil, and the darker its line. For colored pencils, pigments are added to the clay, and virtually no graphite is used. 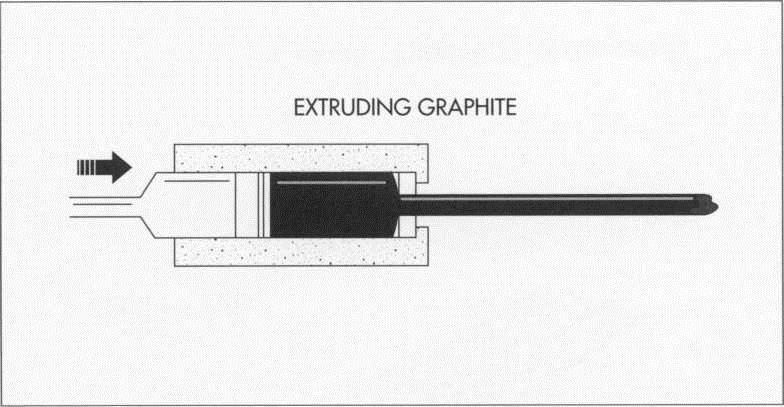 1 Two methods are used to form the graphite into its finished state. The first is an extrusion method in which the graphite and wax mixture is forced through a mold to create a spaghetti-like string, which is then cut to precise measurements and dried in ovens. In the second method, the graphite and clay mixture is poured into a machine called a billet press. A plug is placed over the top of the press, and a metal ram ascends from the bottom to squash the mixture into a hard, solid cylinder called a “billet.” The billet is then removed from the top of the machine and placed into an extrusion press that forces it through a mold, slicing off strips the size of the pencil core. After being cut to size, the cores pass along a conveyor belt and are collected in a trough to await insertion in the pencil wood. 2 The cedar usually arrives at the factory already dried, stained, and waxed, to prevent warping. Logs are then sawed into narrow strips called “slats”; these are about 7.25 inches (18.4 centimeters) long, .25 inch (.635 centimeter) thick, and 2.75 inches (6.98 centimeters) wide. The slats are placed into a feeder and dropped, one-by-one, onto a conveyor belt which moves them along at a constant rate. 3 The slats are then planned to give them a flat surface. Next, they pass under a cutter head that makes parallel semicircular grooves—one half as deep as the graphite is thick—along the length of one side of each slat. Continuing along the conveyor belt, half of the slats are coated with a layer of glue, and the cut graphite is laid in the grooves of these slats. 4 The slats without glue—and without graphite in the grooves—are placed on another belt that carries them to a machine that picks them up and turns them over, so they are laying on the belt with the grooves facing down. The two conveyor belts then meet, and each unglued slat is placed over a slat with glue and graphite, forming a sandwich. After the sandwiches have been removed from the conveyor belt, they are placed into a metal clamp and squeezed by a hydraulic press and left clamped together until the glue is dried. When the pencils are dried, the ends are trimmed to remove excess glue. 5 The next step is shaping, when the sandwiches actually become pencils. The sandwiches are placed on a conveyor belt and moved through two sets of cutters, one above and one below the belt. The cutters above the sandwiches cut around the top half, while the lower set cuts around the bottom half and separates the finished pencils. The majority of pencils are hexagonal, so designed to keep the pencils from rolling off surfaces; a single sandwich yields six to nine hexagonal pencils. 6 After the pencils have been cut, their surfaces are smoothed by sanders, and varnish is applied and dried. This is done with varnishing machines, in which the pencils are immersed in a vat of varnish and then passed through a felt disk, which removes the excess varnish. After drying, the pencils are put through the process again and again until the desired color is achieved. Finally, the pencils receive a finishing coat. 7 The pencils once again are sent on a conveyor belt through shaping machines, which remove any excess varnish that has accumulated on the ends of the pencils. This step also ensures that all of the pencils are the same length. 8 Erasers are then attached, held to the pencil by a round, metal case called a “ferrule.” The ferrule first attaches to the pencil either with glue or with small metal prongs, and then the eraser is inserted and the ferrule clamped around it. In the final step, a heated steel die presses the company logo onto each pencil. Colored pencils are produced in much the same way as black-writing pencils, except that their cores contain coloring materials such as dyes and pigments instead of graphite. First, clay and gum are added to pigment as bonding agents, and then the mixture is soaked in wax to give the pencils smoothness. When the pencils have been formed, the outsides are painted according to the color of the center mixture. Because they travel along a conveyor belt during the manufacturing process, pencils are thoroughly scrutinized before they are distributed to the public. Workers are trained to discard pencils that appear dysfunctional, and a select number are sharpened and tested when the process is complete. A common problem is that the glue of the sandwiches sometimes doesn’t adhere, but this nuisance is usually caught when the sandwiches are being cut. Fischler, George. Fountain Pens and Pencils. Schiffer Publishing, 1990. Petroski, Henry. The Pencil: A History of Design and Circumstance. Knopf, 1990. Thomson, Ruth. Making Pencils. Franklin Watts, 1987. Leibson, Beth. “A Low-Tech Wonder.” Reader’s Digest. July, 1992, p. 92. Lord, Lewis J. “The Little Artifact that Could.” U.S. News & World Report. January 22, 1990, p. 63. Sprout, Alison. “Recycled Pencil.” Fortune. June 15, 1992, p. 113. Urbanski, Al. “Eberhard Faber: the Man, the Pencil, the Born-Again Marketing Company.” Sales & Marketing Management. November, 1986, p. 44.